Martha Steward is an award-winning author of two children's books inspiring pet adoption, blended family issues, and the courage to be a Marine Mom. Darby's Story and Bangle Bear are both MCA Silver recipients for Best in Pet and Animal Care. 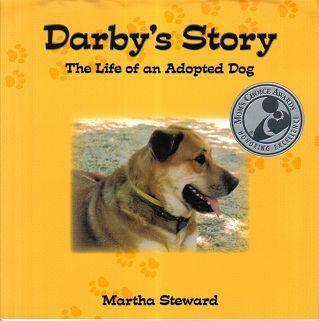 Martha 's blog Darby's Story and More shares information for would-be pet adopters, literacy programs, and features stories to inspire. As our WRADvocate, Martha Steward will be reading out loud at 2pm, Lakeport Public Library on High Street, Lakeport, California. Read more about Martha below! 1. Is there a particular book that has changed your life in some way and why? “The Yearling” By Marjorie Kinnan Rawlings, (now celebrating 50th edition). My word, the book was big, over four hundred pages, I was in 8th grade and wanted to run and hide. There was no way I could finish, yet I was willing to take the challenge that griped my heart with pounding thunder. I had settled in the living room on the coach with a blanket, and opened to the first page. I was hooked like a gold-fish, turning the pages turned into chapters. Stopping was not an option, I was transformed to the setting in Florida, the boy in the story, and the adventures. I wanted more. I finished the book in two weeks, and thought about the book for a few days before writing the book report, (a required part of Mr. Bob Kay’s English class) which was the best mountain I could ever climb. I submitted the book report and waited. The waiting just killed me. My weak writing skills made me feel less of a person. I dreaded the poor grade I just knew I was going to receive. The day approached when the book report got handed back, and I wasn't sure if Mr. Kay wanted to tease me or what, but I got the paper last, and with a not so pleasant expression on Mr Kay’s face, he handed me the report that had been folded in half, to provide privacy. I looked up at my teache and opened to find a giant “A”! When in doubt, I recall what I accomplished that day. It keeps me going. Find the topics that interest the reader, start slow and allow the reader to build from there. With the lasted technology from E books, reading along books, interactive story books, audio books stimulate the young reader to image being there or being that person. 3. It is said that stories and poems teach values. Is there one value in particular that has inspired your life and your good work that might connect back to a book that was either read to you or that you read on your own? There is always a message to the reader within the pages of a book. Stories were created to share values, the lessons of right and wrong, how to stand up for the powerless. I cannot think of a single book that stands out, yet I can say that each book I read provides an insightful value to apply to my life. Between the latest technology and the variety of books being published, we have an endless selection, including the classics. One concern is that the past generation has spent more time playing video games than reading. I hope that with the latest Apps for books, the apps will provide a reading opportunity for this generation of young readers. Storytelling is the oldest form of sharing who we are as a culture, a family, and a person. Reading out loud to your children, students, and the elderly continues that long tradition. A means to discover new lands, take a time-capsule back, or step into the future. Readers grow by transforming their minds to expand our knowledge and share what we have learned. When reading at the local library, the best apart is watching the little light bulbs turn on among the kids around me. JoAnn Kairys is an award-winning author and illustrator of children’s books. She is the founder of a website called StoryQuest Children's Books, a site that connects children with science and nature. She co-authored a book with her son Daniel, a general surgeon in south central Florida. JoAnn believes strongly in celebrating the rich cultural diversity of our lives and heritage. She is deeply committed to eco-friendly and child safe products, and her books are lead-free and made in the USA. I was fascinated by picture books long before I could read. I stayed up long after bedtime, just looking at the beautiful illustrations in picture books that my older sister brought home from the library. I had a soft cover version of "Beauty and the Beast," and couldn't take my eyes away from the vivid colors. My sister taught me a few letters, and that was all I needed to get started reading on my own. I was about 4 years old. Little did I realize that many years later, creating children's picture books for my grandchildren would become a true passion. From those earliest books, a lifetime of joyful reading unfolded. As an early reader, I developed a love of writing. Professionally, I became a medical/science writer, with many first-authored articles published in leading peer-reviewed journals. As my technical writing skills developed, I realized that even the most data-driven, and what might be considered "dry" writing, must tell a compelling story! I taught English to underserved high school students with reading challenges. I had no formal training in special education, but loved sharing stories. I used music to help engage my classes. I told them the basic story and we acted out "Romeo and Juliet" in the classroom with music of the students' choice. Everyone participated. Then we read parts of the play they expressed the most interest in. This was fun and a great way to bring students into reading without "making" them read. They were already hooked on the story. 4. It is said that stories and poems teach values. Is there one value in particular that has inspired your life and your good work that might connect back to a book that was either read to you or that you read on your own? As an early reader I devoured just about every book I could get from the library. A turning point was "Little Women"--my first "big" book. I loved the characters, their interactions and their love of storytelling. Mostly, I loved the focus on family and the playful sisters. I have two older sisters, so the story was especially appealing. The value of "family" jumped off the pages for me -- perhaps simplistically at first. But, looking back, I understand how this inspired my desire to write. I've had the good fortune to travel extensively as a health care professional. In every country, I visit schools and medical centers. In Russia, I visited many orphanages and read to children in Russian and English, with books donated by US organizations. No surprise, then, that I love writing for my grandchildren, creating stories about their loving relationships with each other and family. For me, the power of reading is interacting and sharing thoughts, impressions and wonderfully expressive vocabulary. Even without a book in hand, we read aloud through conversation, using the experience of the moment: at a check out counter, waiting at a red light, doing the most mundane things... we make up stories. The more animated I am, the more the children are engaged and jump in. Some of my grandkids are trilingual, so we mix up words and phrases in fun ways. We sing a lot. We're just plain silly. The best question they can ask me is, "Can we do that again?" When I hear them laughing and truly enjoying the experience, it's the best music to my ears! Katy Farber is our WRADvocate from Vermont! Katy is a teacher, and she's getting all her students involved in World Read Aloud Day. All this week, her sixth graders are creating bookmarks that support reading as a life changer. They will sell these bookmarks on March 7-9, to support Litworld and global literacy. On World Read Aloud day, her class will read aloud to every elementary student at Rumney Memorial School throughout the day. In-between reading aloud, her students will reflect on the importance of reading through poetry, and writing. They hope to share these reflections at an all school meeting in the coming weeks. Katy is also the founder of a website called "Non-Toxic Kids" in 2007 after the birth of her second daughter. She was constantly reading about environmental health, green living, and parenting issues, and wanted to share what she learned with other parents. One of my favorite memories about growing up was having my parents read The Monster at the End of this Book to me over and over again. I loved turning the pages and having Grover call me strong. It was always a cuddly time for my parents and I, among busy days. They took turns reading it to me and would really ham up Grover’s voice—it was so joyful. This is such a simple, sweet, and short book—which shows you don’t have to hold up bedtime for 30 minutes to read aloud to your child. I also remember having these encyclopedias all about animals. They were yellow with fancy embossed gold on the covers and spines. I loved to look at all the pictures of exotic and interesting animals, and read about them. These books seemed like a key to another world, one of flamboyant flamingos and saber-toothed tigers. 3. What advice would you give to teachers; parents and caregivers who want to reach their struggling readers? Keep searching for books that spark that interest. And read, read, read. Read in front of your child. Laugh out loud when reading. Gasp and hoot and holler. Show your child the pictures in magazines and discuss the articles. Find the gripping stories like Harry Potter, and hook them in. Read aloud. Every.Single. Night. Eventually your child will grab the book from you to read, or beg you to read more. 4. What book do you think young people should not miss? in order to nurture a child to become a lifelong reader? immigrant experience in a real and meaningful way. Giving students time to read is essential, and absolutely critical to developing children into life long readers. Also, parents and teachers modeling a geniune love of reading and eternal curiousity is a wonderful example for kids. 6. Will you share with us some final meditations on the power of the read aloud and of reading in general to the emotional lives of children and for all people? how surreal, confusing, and troubling it is. This little girl had an uncle who had recently died, and she said that reading that scene made her feel normal and not so alone. And that is what reading aloud does. It connects us, it validates us, it enriches it empowers us…and so much more. We are proud to have Greta Guerrero on board as our WRADvocate from the American School Foundation of Monterrey in Mexico! The American School Foundation of Monterrey is a private, non-profit, independent, international day school providing a U.S.-type education to international and Mexican students. Greta is the Nursery Team Leader at the school, where they teach young students the English language while using the Spanish as a support language when needed. In their program, children get more familiarized with the second language, and their use of English increases. Additionally, the program Greta leads also places a strong emphases on developing early literacy skills. We are excited to have an international representative on board to spread the power of words to the world! 1. How has what you've read influenced you professionally? I studied Spanish Literature as my major in college. I read and analyzed many books, authors and literary genres. They all influenced me in life and gave me the tools on how to recognize a good book or a good story and enjoy it or simply be touched or moved. When I became a preschool teacher eleven years ago, I read picture books since day one, and each story, even if it is a short one, has something to teach me. I become in touch with the characters and with the lives of the authors; I can read between the lines of the story and discover great things. I discover new worlds and the experiences of a person, feelings everyone experiences, and it reminds me that we are not alone. 2. It is said that stories and poems teach values. Is there one value in particular that has inspired your life and your good work that might connect back to a book that was either read to you or that you read on your own? Giraffes can't dance is a story that has inspired my life by accepting everyone as a unique individual with a special gift. Every person should be valued and respected as a human being, and everyone deserves the right to live in a peaceful world where they can fulfill their lives doing what they want to do and accepting who they are. Most of all, the story inspires us to be happy. 3. What do you think is most essential for teachers, parents and caregivers to do in order to nurture a child to become a lifelong reader? Good readers should treat the "reading moment" as a magical one, as a privilege. They should read in a way that the child wants to keep reading to find that magic in the reader's voice and imagination. The tone of voice, the way we handle books like treasures, the way we refer at a story with our own personal reflections, should influence every chid. If every child has the opportunity to be in contact with technology and are taught to use the tools wisely, they have the biggest library in their hands! Hopefully, everyone has a chance to use technology as a bridge to access any online book with the specific theme each reader is interested in, and can motivate them to keep on reading forever! I believe every single human being deserves the right to read. Each person should be able to imagine, to dream, to believe... If we teach young readers that they are blessed with the ability to read, they will understand that the future is in their hands. They must undertand that as a readers, they need to commit and spread the seed amongst other non readers around their lives. Mexico needs true readers who are willing to share their gift. Poverty in our country is around the corner, but we can start here in our community, set the example, as I believe we need to start changing our world. To obtain peace, people need to think and learn and discover and create. If we plant the the seed around our future readers, they will lead us someday, and we will be living in a better world. To find out more about Greta and the American School Foundation of Monterrey, visit them on their website here! Thank you for joining us Greta! Lyz is our WRADvocate from Iowa. She is a blogger and writer, and her writing has been published on Babble.com, Mommyish.com, YourTango.com, Glo, AOL and more. She has also been published in magazines like Real Weddings and Guideposts, Yellow Medicine Review and The Louisville Review and her writing has been syndicated on MSNBC.com and The Today Show website and anthologized in The Contemporary Reader. We are very lucky to have her as a WRADvocate, because as it turns out, she is a self-proclaimed social media ninja. We're quite confident she'll be creating a lot of "hits" for WRAD on the internet! I was a little insomniac. So, to stop me from roaming the halls at 5am, my parents gave me a bed lamp and told me I could read if I couldn't sleep. I read so many books snuggled under my covers listening to my sister sleep soundly. Professionally, I am a writer. But that's not what I set out to be. I wanted to be a lawyer or a teacher. But reading is my first love and when you love them, words become a part of you in a very elemental way. In the end, I think I write because it's the only way I've discovered to read and get paid for it. Not all readers are created equal. My sister is a prolific consumer of books, but because of an eye problem she had early on as a child, she's hated reading. She instead listens to books on CD or on her MP3 player. In the end, for most people, it's not about the reading, it's about the story. You don't hook kids on books by telling them it's good for them. You hook kids on books by telling them there are pirates between those pages. 4. Do you have a memory of someone reading aloud to you that changed you in some way? How did that change you? I shared my memories of reading aloud here. But I also remember my mom reading me The Little Princess, just to me, with seven brother's and sisters that lone action made me feel incredibly loved. I also read my daughter The Bridge to Terabithia when she was 8 weeks old, while I was trying to get the hang of breastfeeding and the catharsis of being able to cry through the book about something that to me was so difficult (breastfeeding) was very helpful. Oh my, I think that assumes more depth in my mind than I have. My relationship with books is deep and complicated, but it's my own. I wish that for everyone.